River Rally, River Network’s annual conference will take place in Cleveland, Ohio, from June 21–24, 2019. The event will take place along the banks of the Cuyahoga River and mark the last time that river caught fire from unregulated pollution fifty years ago, a pivotal event that sparked the environmental movement that led to the establishment of the Clean Water Act. Blue Accounting’s Source Water Initiative recently launched visual tools that illustrate work to protect source water in the Great Lakes Basin. The visual tools measure progress toward four goals: protecting drinking water from nutrient impacts; ensuring all public water supply systems are guided by up‐to‐date protection strategies; taking action on contaminants of emerging concern; and building binational consensus on strategies for source water protection across the Great Lakes Basin. The National Ground Water Association will be hosting its annual “Groundwater Week” from December 3-7, 2018 in Las Vegas, NV. The event brings together all aspects of the groundwater professions to increase professional development, networking, and training opportunities. On Wednesday, September 12, 2018, from 12:00 pm – 1:00 pm (eastern), the Source Water Collaborative (SWC) will host a free webinar with The Trust for Public Land (TPL) entitled, “Multi-Purpose Decision Support Systems for Source Water Protection Strategies.” The purpose of this webinar is to demonstrate the use of decision support tools and multi-purpose landscape analysis systems that can strengthen the ability of water suppliers to develop land protection strategies that address threats to drinking water sources. The Healthy Watersheds Consortium Grant Program’s second-year of awards expands the pace of proactive watershed protection in the U.S. through conservation and improved stewardship of hundreds of thousands of acres of lands that provide drinking water, flood risk reduction, and an array of economic and environmental benefits. The sixteen awards total $2.75 million and will benefit organizations and partnerships in 18 states. The Heathy Watersheds Consortium Grant Program was conceived by Source Water Collaborative member the U.S. Environmental Protection Agency Office of Water (EPA) and launched in late 2015. EPA co-funds the program along with another SWC member organization the Natural Resources Conservation Service (NRCS) and the U. S. Endowment for Forestry and Communities (Endowment), which manages the partnership. The lands around our water sources serve as vital water infrastructure for cities around the world. These lands collect, store and filter our water, and when managed well, can provide a number of additional benefits to people and nature. Beyond the Source, a new report from The Nature Conservancy in partnership with the Natural Capital Project, Forest Trends, the Inter-American Development Bank, and the Latin American Water Funds Partnership, seeks to illustrate how nature-based solutions can be implemented at a scale that will make a visible difference in our collective pursuit to create a sustainable world and improve the lives of billions of people. Beyond the Source analyzes source watersheds of more than 4,000 of the largest cities around the world, and finds that four out of five cities can reduce sediment and nutrient pollution by a meaningful amount through forest protection, reforestation and improved agricultural practices. These natural infrastructure solutions also provide a number of co-benefits, including improving the health and livelihoods of people living in cities and rural areas, preserving plant and animal biodiversity, trapping and storing carbon dioxide and building more resilient communities in the face of climate change. The research highlights water funds as a successful mechanism for downstream water users to fund upstream land conservation and restoration, securing improved water quality and supplies in return. An analysis of the cost for implementing source water protection activities shows that one in six cities could recoup the costs through savings in water treatment alone. Other cities can place a value on the co-benefits and “stack” the total value to realize a positive return on investment. The maps and underlying data used in Beyond the Source represent a rich set of resources that lend themselves to further exploration. The Nature Conservancy has developed an online companion to the report, accessed via www.protectingwater.org, that features an interactive map and enables users to explore the data. To download the report and executive summary and access videos, infographics, and photo galleries, visit www.nature.org/beyondthesource. We are pleased to welcome American Rivers to the Source Water Collaborative. American Rivers has a long history of work related to our mission of creative collaboration to protect drinking water sources. American Rivers protects wild rivers, restores damaged rivers, and conserves clean water for people and nature. Since 1973, American Rivers has protected and restored more than 150,000 miles of rivers through advocacy efforts, on-the-ground projects, and an annual America’s Most Endangered Rivers® campaign. Headquartered in Washington, DC, American Rivers has offices across the country and more than 250,000 members, supporters, and volunteers. American Rivers works with partners including water utilities, private landowners, and government to protect source waters in a variety of ways. Key efforts include creating funding mechanisms, securing local codes and ordinances, establishing conservation easements, improving federal forest management and designating Wild and Scenic rivers. We look forward to working with American Rivers in the years ahead. The Source Water Collaborative is pleased to announce the release of its latest source water protection outreach tool: Source to Tap. Now available through the Collaborative’s website, Source to Tap invites users to explore an interactive landscape to learn how various Clean Water Act “tools” can be employed to reduce pollution in sources of drinking water. It is designed to enable a wide range of practitioners—from state water quality managers to watershed activists—to engage in the many opportunities to leverage the regulatory and non-regulatory provisions of the Clean Water Act, such as Water Quality Standards, Designated Uses, and Total Maximum Daily Loads (TMDLs) to protect drinking water sources. Source water protection, by its very nature, must be a collaborative undertaking among various parties having differing roles, levels of authority, access to information, and expertise. It relies on a wide array of stakeholders, perspectives, and information. Source to Tap demonstrates what opportunities for participation exist to contribute local knowledge, data, and important perspectives to inform state clean water and drinking water program managers align their efforts to better target and apply the Clean Water Act to protect source water. The infographic adapts strategies from the popular publication, Opportunities to Protect Drinking Water and Advance Watershed Goals Through the Clean Water Act: A Toolkit for State, Interstate, Tribal and Federal Program Managers, which was developed via a multi-year collaborative effort by state and EPA water quality managers across clean water and safe drinking water programs. Access Source to Tap from the Source Water Collaborative website “Quick Tools” toolbar or follow this link. On February 19, the Environmental Protection Agency (EPA) Office of Ground Water and Drinking Water released the Drinking Water Mapping Application to Protect Source Waters (DWMAPS). This user-friendly online mapping tool provides water system operators, state programs, federal agencies, watershed organizations, and others with critical information for assessing and protecting sources of drinking water in any location or watershed in the country. DWMAPS helps users identify potential sources of contamination, view information on watershed health and source water pollution, prepare for accidental spills and releases, locate watershed restoration projects and potential partners, and more. While this version is intended for public use and does not display the locations of Public Water System facility intakes, later secure versions will allow state drinking water program managers and water utilities to integrate their own state and local data with DWMAPS. EPA developed DWMAPS in consultation with EPA regional drinking water programs, state drinking water regulators, public water systems, and Source Water Collaborative member organizations, which also provided feedback to DWMAPS during map beta testing. Visit the SWC’s Map My Drinking Water resource page to access DWMAPS. Register now for the second of four webinars on the new resource,“Opportunities to Protect Drinking Water Sources and Advance Watershed Goals through the Clean Water Act (CWA): A Toolkit for State, Interstate, Tribal, and Federal Water Program Managers.” The webinar will be held on April 28th from 12:30-2:00 PM (EST) and will discuss using CWA programs like Water Quality Standards, Monitoring, Assessment, and Impaired Waters Listings to protect drinking water sources. SWC members the Association of State Drinking Water Administers (ASDWA), the Association of Clean Water Administrators (ACWA), and the Ground Water Protection Council (GWPC) are jointly hosting this four-part webinar series, which offer an in-depth discussion on how to coordinate CWA and SDWA activities to achieve mutual goals. For more information, including state examples, please refer to the Toolkit above. The U.S. Environmental Protection Agency (EPA) invites nominations of qualified candidates to be considered for a three-year appointment to the NDWAC. The 15-member Council was established by the Safe Drinking Water Act (SDWA) to provide practical and independent advice, consultation and recommendations to the EPA Administrator on the activities, functions, policies and regulations required by the SDWA. This Federal Register notice solicits nominations to fill six new vacancies from December 2014 through December 2017. Please review the Federal Register notice for details on submissions. On May 27, 2014, USDA Secretary Vilsack announced a unique new conservation initiative that is intended to give “private companies, local communities, and other non-government partners a way to invest in what are essentially clean water start-up operations.” “Eligible partners include private companies, universities, non-profit organizations, local and tribal governments and others joining with agricultural and conservation organizations and producers to invest money, manpower and materials to their proposed initiatives.” States and water and wastewater utilities are included in the list of eligible applicants. Anticipated first year USDA funding is nearly $400M. Pre-proposals are due July 14. USDA will select applicants to submit final proposals, due September. 26, 2014. See details here. Note: NRCS is offering question-and-answer sessions on the Regional Conservation Partnership Program (RCPP) both online and in person. Each webinar will last one hour. Click here for log-in instructions for the RCPP webinar. In-person Session: June 6 (Friday) at 11 a.m. EST. The session will be held in Jamie L. Whitten Building in Room 107-A. If you have questions or to RSVP, contact NRCS. Provide for consideration of groundwater resources in agency activities. Encourage source water protection and water conservation. Establish procedures for reviewing new proposals for groundwater withdrawals on NFS land. Require the evaluation of potential impacts from groundwater withdrawals on NFS natural resources. Affect procedures or impose any new conditions on state-issued water rights. Affect existing or future tribal water rights settlements or water compacts. Impose any new regulations or requirements on locatable, leasable, geothermal, or mineral material operations. Change the way state water quality regulations or tribal water quality standards are promulgated or administered. Give the Forest Service any new authorities. The Forest Service welcomes public comment within 90 days from the date of publication of the notice in the Federal Register (published May 6, 2014). Comments must be received electronically. Electronic comments may be submitted by following the instructions at regulations.gov or via email to fsm2500@fs.fed.us. As a part of its ongoing commitment to encourage state and local actions to protect sources of drinking water, the Source Water Collaborative (SWC) is pleased to announce its support of three new pilot programs including watershed-based Sheridan, Wyoming; countywide efforts in Lancaster County, PA; and state-wide efforts in Wisconsin (with Rock and Sauk Counties). The selected pilots have a wide variety of partnerships and unique project champions, including drinking water utilities; county planning commission; USDA (NRCS, Forest Service); universities; state departments of environment, health services, and game/fish; state geological surveys; NGOs (Trout Unlimited, Nature Conservancy); associations representing watershed, rural water, livestock, and conservation interests; and EPA Regional Offices. Click here for more details. EPA will spend more than $20 million to support the monitoring, the majority of which will be devoted to assist small drinking water systems with conducting the monitoring. Click here for more details. FFA (formerly Future Farmers of America) recently posted 20 source water protection lessons for high school agricultural science students – available here. A product of a USDA-EPA partnership with FFA, the lessons are available online to FFA’s network of over one million high school agriculture science students and their instructors. Content covered includes the water cycle, drinking water basics, the watershed approach, and agricultural conservation practices to protect water quality. Click here for more details. EPA will accept public comments on the draft strategy until May 17, 2012. To read or submit a comment on the Draft Strategy visit: http://epa.gov/water/climatechange. Click here for more details. Continuing its partnerships with green infrastructure communities, the EPA is offering technical assistance for green infrastructure projects protecting water quality. The effort is part of the agency’s Green Infrastructure Program that will accept letters of interest until April 6, 2012. The available $950,000 will be distributed among 10-20 projects and will be directed to watersheds and sewersheds with water quality degradation from urban stormwater. EPA’s new website on nutrient pollution policy and data can help individuals access information on EPA actions to reduce nutrient pollution, state efforts to develop numeric nutrient criteria, and EPA tools, data, research, and reports related to nutrient pollution. Visit this policy and data focused website at http://epa.gov/nandppolicy. Click here for information about another EPA website designed for homeowners, students and educators. A February 2012 NRWA Water University webinar titled, “Take Back Your Community From Nitrates—Lessons Learned,” showcases the efforts of a rural Minnesota community in addressing elevated nitrate levels. Led by Sourcewater Protection Specialist Aaron Meyer, the webinar explains how the community partnered with local farmers and tested the effects of fertilizer on groundwater quality and crop yields. The Salmon Falls Watershed Collaborative, supported in part by the national SWC, has been awarded the 2012 U.S. Water Prize by the Clean Water America Alliance for watershed-based approaches that innovate, integrate, and educate toward water sustainability. This inter-state collaborative between Maine and New Hampshire unites local, state and federal partners to protect forests and reduce pollution from existing land uses and anticipated development. For more information about the prize, click here. A new study published by the U.S. Geological Survey examines the movement of phosphorus in soil and groundwater of farm settings in five states—Washington, California, Nebraska, Indiana, and Maryland. The report assesses the impact of various farming practices on phosphorus movement—information that is useful in creating best practices to limit phosphorus transport from agricultural fields. The EPA’s newest DVD, “Reduce Runoff: Slow it Down, Spread it out, Soak it in!” teaches viewers how to control runoff in urban areas. The DVD was created in partnership with the U.S Botanic Garden and consists of four educational videos that can be used for outreach or to fulfill requirements for EPA’s Stormwater MS4 program. The videos can be viewed online or ordered from the National Service Center for Environmental Publications (NSCEP). Click here for viewing and ordering information and to find out more about the videos. Officials at the USDA Economic Research Service have released new data that brings together U.S. fertilizer consumption data from 1950 to 2010. To enhance analytic efforts, the data is organized by plant nutrient, major selected product, and consumption of mixed fertilizers, secondary nutrients, and micronutrients. This information can prove useful in tracking growing nutrient loads and identifying usage trends. On December 6th, the North Carolina Source Water Protection Program held a one-day workshop to launch a statewide Source Water Collaborative. 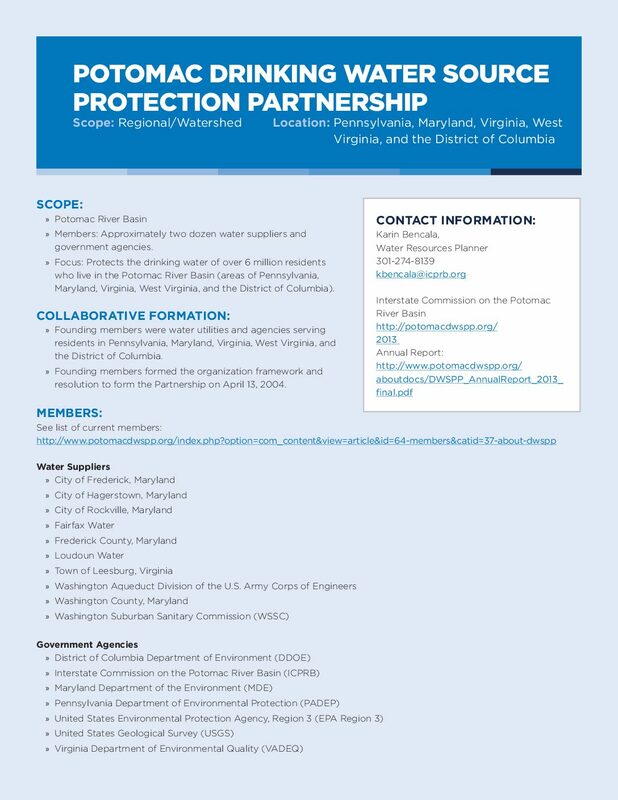 The state Collaborative is envisioned as an autonomous group that will work together across various programs and policies to strengthen and advance protection of the states’ drinking water sources. Click here for more details. The Water Research Foundation has released two new publications that offer a vision and roadmap that can guide U.S. water utilities and supporting groups with a unified strategy for coherent, consistent, cost-effective, and socially acceptable source water protection programs. Click here for more details and to access these publications. EPA has added updated U.S. Geological Survey (USGS) SPAtially Referenced Regressions On Watershed attributes (SPARROW) data to the nitrogen and phosphorus pollution data access tool, a tool intended to help states develop effective nitrogen and phosphorus source reduction strategies. Click here to learn more and to access the updated tool online. USDA announced that pre-proposals for FY12 Conservation Innovation Grants (CIG) are due by January 31. This year’s CIG projects will focus on nutrient management, energy conservation, soil health and wildlife. For more information on CIG from the Natural Resources Conservation Service, click here. The webinar will consist of three presentations focusing on Clean Water State Revolving Fund programs and ways to coordinate on the state level. In an effort to improve waterways in the nation’s urban areas, the EPA has begun soliciting proposals for its new Urban Waters Small Grants. The Small Grants emerge as the latest work of EPA’s Urban Waters Program and will be awarded to projects across the country that improve water quality and support community revitalization. In light of the increasing problem posed by nitrogen and phosphorus pollution, the Environmental Protection Agency announced its new Nitrogen and Phosphorus Pollution Data Access Tool (NPDAT) and a free demonstrative webinar on November 30, 2011. In addition to NPDAT, the series will feature other useful tools for tracking and reducing nitrogen and phosphorus levels. The Source Water Collaborative (SWC) has earned a guest article in the National Association of Conservation Districts’ fall publication of “The Resource.” Co-written by various member groups, the article explains SWC’s mission and the importance of joint efforts by SWC and NACD. A new study by the USDA’s Great Lakes Conservation Effects Assessment Project, (CEAP), found that farmers in the region have reduced losses of sediment, nitrogen, and phosphorous by employing effective conservation techniques. NACD’s “Conservation Benefits: Putting Value Where It Belongs,” which focuses on several ecosystem services, including source water, is now available. Know a great supporter of conservation who deserves national recognition? NACD is now taking nominations for awards! This year’s deadline is Sept. 30. Click here for more information. GWPC Announces Interregional Source Water Roundtable as part of 2011 Annual Forum on September 28th in Atlanta, GA. The forum will showcase the success of the SWC, regional collaboratives, and state program efforts to foster support for future regional collaborations. New Funding Opportunity for Forest and Water Climate Adaptation Planning is Available. Application Deadline: 9/19/11. Six rural communities will be provided $10,000 scholarships. The Model Forest Policy Program is now accepting applications for 2012 Climate Solutions University: Forest and Water Strategies.